Manchester Airports Group: Primary Apprentice Challenge! 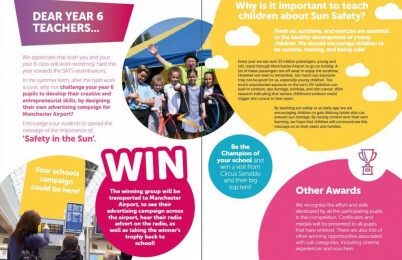 Building on the success of their Secondary Dragons Den competition Manchester Airports Group have developed a Primary Apprentice Competition which will be open to up to 20 schools. Teachers can follow a free ‘teacher pack’ and a series of videos to deliver the lessons and the challenge is to design an advertising campaign under the theme ‘Safety in the Sun’.